Cheat Lake as seen from Snake Hill Wildlife Management Area (WMA). Photo courtesy Brian Powell. 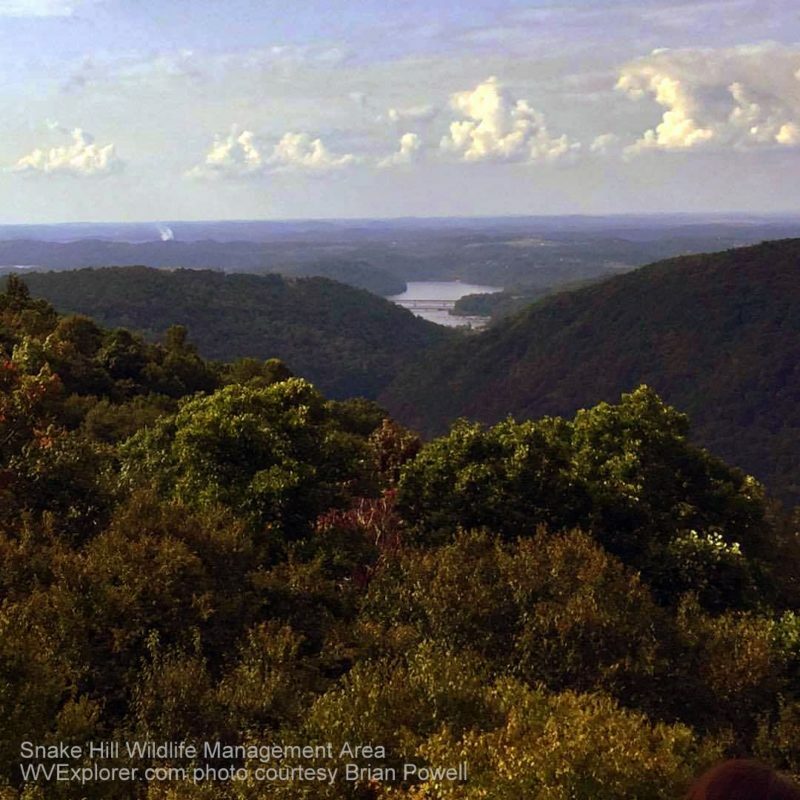 The 3,092-acre Snake Hill Wildlife Management Area (WMA) traverses gently rolling highlands and steep slopes on the canyon of the Cheat River, forested, respectively in oak and hickory and cove hardwoods. Game traditionally hunted in the management area includes deer, grouse, squirrel, raccoon, and turkey. The Cheat River accommodates fishing opportunities for bass and channel catfish. Camping is prohibited in the management area. Directions: The Snake Hill Wildlife Management Area is located in western Preston County and eastern Monongalia County. From Cheat Lake, WV, follow Cheat Road (CR-857) south two miles to a left turn onto Tyrone Road. Follow the latter 1.6 miles to a left turn onto Snake Hill Road. Follow the latter approximately 1.5 miles into the management area. From highway WV-7 at Masontown, WV, follow Rohr Road (CR-19) north approximately 2.5 miles. The latter route becomes Snake Hill Road, and the management area is located 2.5 miles ahead. The Snake Hill WMA is managed by the W.Va. Division of Natural Resources. The management area is located across the canyon of the Cheat River from Coopers Rock State Forest. Further information on lodging, dining, and recreation near the Snake Hill Wildlife Management Area may be found in our guide to travel in the Monongahela Valley Region in northern West Virginia, in which the management area is located.